Who invented Photography? There are many names associated with the invention of Photography and the development of the camera. Joseph Nicephore Niepce took the first photograph in 1827 and is often credited as the inventor of photography. The Camera Obscura, an early pinhole camera, dates back to the 5th century BC and it was Giambattista della Porta who introduced the idea of using a lens instead of a pinhole. Who invented Photography? Johann Heinrich Schulz developed the use of silver nitrate and the basis of the photographic process and Louis Daguerre invented the Daguerreotype process. William Henry Fox Talbot invented the Calotype process and Frederick Scott Archer invented the Collodion process. Richard Leach Maddox invented the Dry plate process which led to the invention of roll film and the Kodak Camera by George Eastman. Definition of Photography: Photography is defined as the process of recording images on sensitized material by the action of light and the chemical processing of this material in the production of pictures to produce a print, photograph, slide, or cine film. Fact 1: Who invented Photography? The Camera was invented by George Eastman in 1888 during the Second US Industrial Revolution era of inventions (1850 - 1914) which was a significant addition to advancements made in the area of Science and Technology. Fact 2: Before Photography? Prior to the invention of photography, the only ways to preserve images were the creation of portrait paintings, oil paintings, water colors and drawings. These methods required a talented artist, were time consuming and could be extremely expensive. Fact 4: Who invented Photography? Pinhole Cameras: Pinhole cameras have a tiny hole (pinhole aperture) but no lens, effectively a light-proof box with a small hole in one side. All other cameras use a lens for focusing. Fact 5: Who invented Photography? Camera Obscura: The Camera Obscura dates back to the 5th century BC and its design was documented by the Chinese philosopher Mo-Ti (470-391 BCE). In 1490 Leonardo Da Vinci gave two descriptions of the camera obscura, meaning "dark chamber", in his notebooks. Fact 6: Who invented Photography? Giambattista della Porta: In 1558 the Italian Scientist Giambattista della Porta wrote in his 'Magia Naturalis' about using a convex mirror to project the image onto paper and to use this as a drawing aid. The use of a lens instead of a pinhole was therefore introduced. Fact 7: Who invented Photography? Johann Heinrich Schulz: In 1727 Johann Heinrich Schulz (1687-1744) discovered that a piece of chalk dipped in silver nitrate turned black from white when exposed to the sun and that the unexposed side remained white. The chemical process from materials changing when exposed to light formed the basis for the development of the photographic process. Fact 8: Who invented Photography? Joseph Niepce: In 1827 the French inventor Joseph Nicephore Niepce (1765 - 1833) developed the camera obscura and took the first photo with it producing an image of a view from the Niepce family house in Gras, France. The first photograph (he called it a Heliograph) wasn't ideal because it took 8 hours of light exposure to make a picture. Joseph Niepce is often credited as the inventor of photography. Fact 9: Who invented Photography? Thomas Wedgwood: The British physicist Thomas Wedgwood (1771-1805), assisted by Sir Humphrey Davy (1778-1829), published a paper in 1802 entitled "An Account of a method of copying Paintings upon Glass, and of making Profiles, by the Agency of Light upon Nitrate of Silver". Fact 10: Who invented Photography? Louis Daguerre: In 1837 Louis Jacques Mande Daguerre (1787-1851), a painter of theater scenes, invented the Daguerreotype process in which a picture, made on a silver surface, was sensitized with iodine and developed by exposure to mercury vapor. The Daguerreotype process shortened exposure time to a half hour. Louis Daguerre invented glass plates and discovered that an image could be made permanent by immersing it in salt. 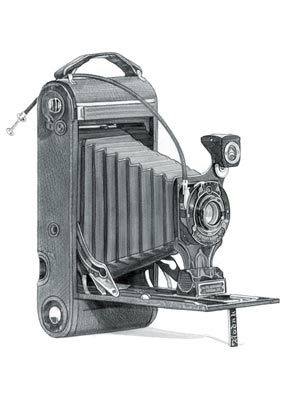 The first commercially-manufactured camera, the Giroux Daguerreotype Camera, was designed by Daguerre and made by Alphonse Giroux, in Paris, France in 1839. Fact 11: Who invented Photography? Alexander Wolcott: In 1840 the American inventors Alexander Wolcott and John Johnson were the first to receive a patent for their daguerre type camera in the United States. Alexander Wolcott opened the earliest known photography studio he called the "Daguerran Parlor" in New York. Fact 12: Who invented Photography? William Henry Fox Talbot: In 1841 the British scientist William Henry Fox Talbot (1800 - 1877) invented the Calotype or Talbotype Process that made it possible to make multiple copies of the same picture. Fact 13: Who invented Photography? Frederick Scott Archer: In 1851 the Englishman Frederick Scott Archer (1813 - 1857) invented an early photographic technique called the Wet-collodion process, aka collodion process, that made it easier to obtain images with exposures of just a few seconds and also enabled multiple positive copies to be quickly made from the same glass negative plate. Fact 14: Who invented Photography? James Ambrose Cutting: In 1854 James Ambrose Cutting, of Boston, United States of America, invented and patented the Ambrotype photographic process taking and preserving pictures on a film of collodion upon the surface of a sheet of glass. Cutting made improvements to the Daguerreotype process which produced a one off positive image on a silvered copper plate which could not be readily replicated. Fact 16: Who invented Photography? Richard Leach Maddox: In 1871 the English physician Richard Leach Maddox (1816 – 1902) invented an improved type of photographic plate called the Dry plate process, aka the gelatin silver process. In the Dry plate process warmed glass plates were coated with an emulsion of gelatine and silver nitrate and allowed to dry. Fact 17: Who invented Photography? George Eastman: The Dry plate process led to the invention of the roll film by George Eastman in 1888 and his legendary Kodak camera. Fact 18: Who invented Photography? Lumiere Brothers: In 1907 the French brothers Louis and Auguste Lumiere had invented an additive color process they called "Autochrome". Fact 19: Who invented Photography? Samuel Shlafrock: In 1923 the American inventor Samuel Shlafrock invented the Instant Camera. Fact 20: Who invented Photography? Edwin H. Land: In 1948 Edwin H. Land invented the Polaroid camera that allowed people to take a photo and have it developed immediately. Fact 21: Who invented Photography? Steven Sasson: In 1975 Steven Sasson invented the first digital camera at Eastman Kodak. Fact 22: Who invented Photography? Quentin Stafford-Fraser and Paul Jardetzk: In 1991 Dr. Quentin Stafford-Fraser and Paul Jardetzk invented the Webcam enabling a digital camera to be attached to a computer through the USB port. Fact 23: Who invented Photography? Philippe Kahn: In 1997 the first camera phone was invented by technology innovator Philippe Kahn. Fact 24: Who invented Photography? Kodak EasyShare: In 2001 the Kodak Easy Share camera went on sale making it easy to take photos and download them to the computer. Fact 25: Who invented Photography? Wireless cameras: In 2012 Wireless cameras were developed Kodak that did not have to be connected to a computer in order to download and share photographs.